added by bloggers by the end of May! I kept pondering what to give you. 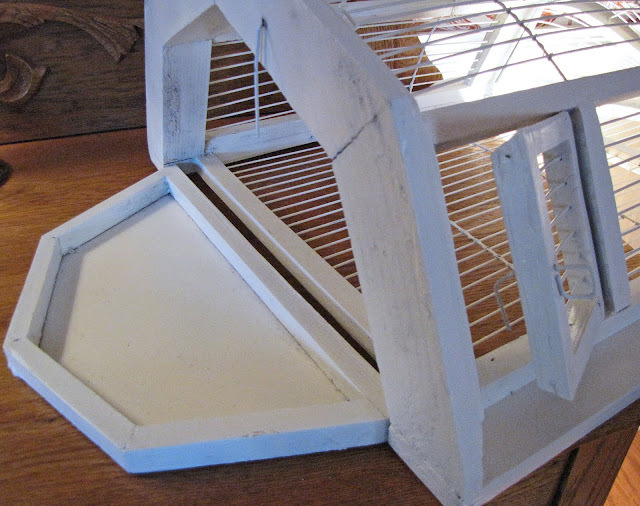 A demilune wall or table bird cage. so it is a nicely sized cage! That opens on the bottom and has a little door on the right side. And some clips from IKEA. And found these pretties for her. This is a great give away!! You did an awesome transformation on the bird house!! Love it. Very nice giveaway. Leslie! Your giveaway is so generous! I really hope I win, hehe. Please count me in. Oh and yes, I am already a happy follower. Oh, Leslie, it's so pretty! Count me in! I'm also now a happy follower! What a wonderful and generous giveaway! I love how you transformed your church yard sale find into this treasure! Please enter me. I've been following you ever since I found this blog! So much great inspiration! Oh,my! 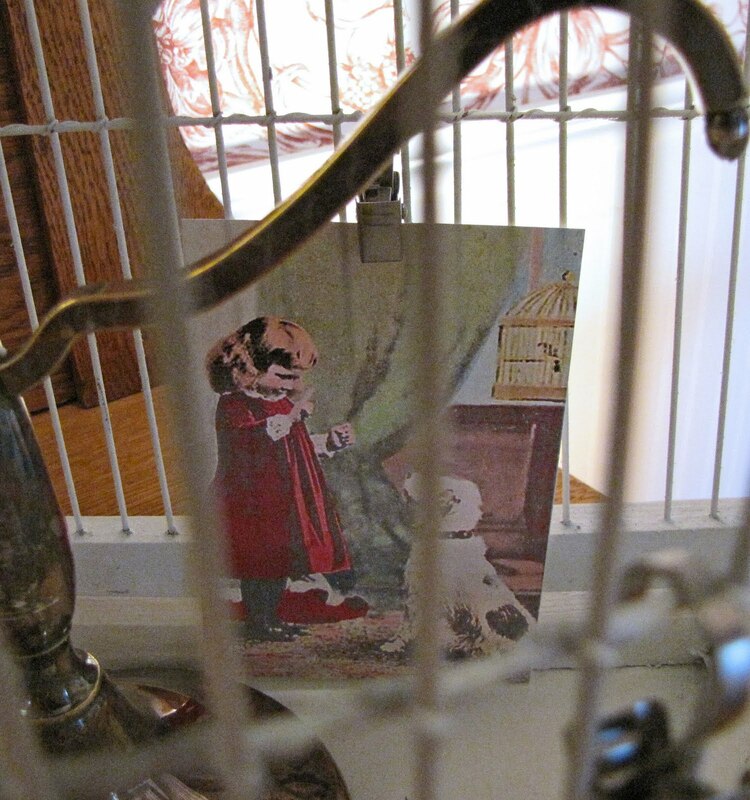 I crave birdcages. Already have 3 and this one would be so happy to share my porch with the others, I'm sure! Thanks so much for your generosity. Sure would love to win! I am now a new follower of your blog & look forward to checking out all your posts. 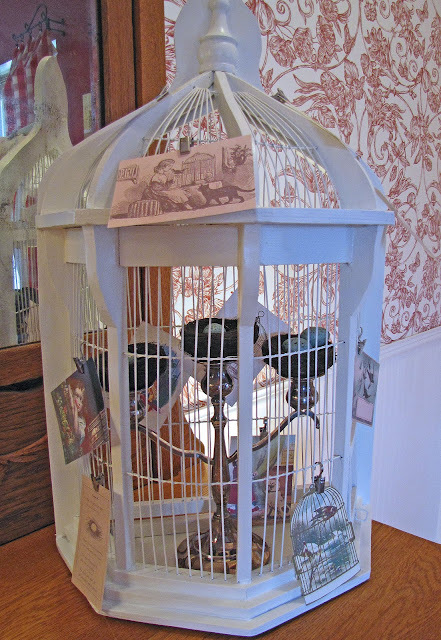 What a cute bird cage and I love all the stuff you added to it! Wow Leslie! This is such a lovely giveaway! You are soooo generous! Everything looks so beautiful the way you have it displayed...count me in! The bird cage looks great white!! Im also already a follower! yes, please. can we make it two in a row? 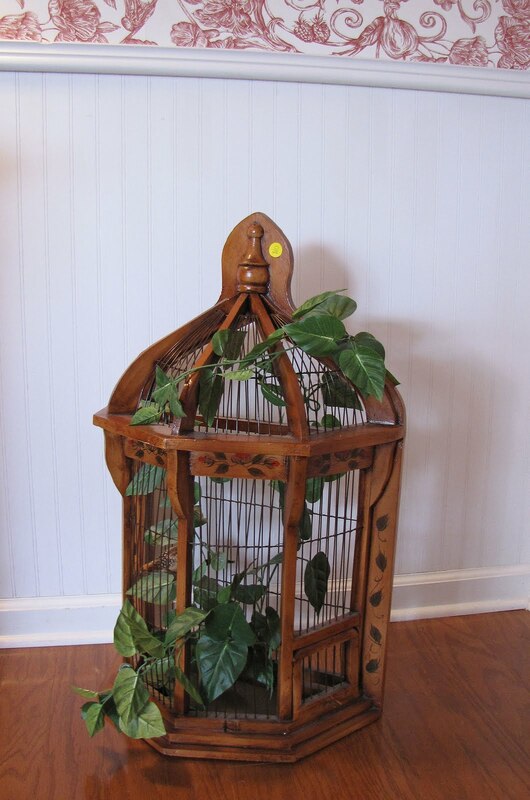 i have been wanting a bird cage for ages. Hi Leslie, I wanna follow HA. I need to hang out more w/ you girls for some domesticated HELP ! My email is kim.alexander@charter.net. Beautiful giveaway! so glad to have found your blog! Love your blog and am now a new follower. Hi, new friend!! 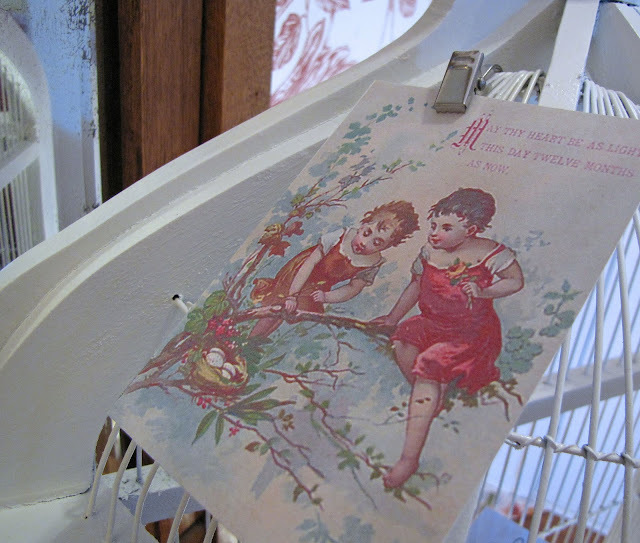 As a little girl, my Grandmother taught me to love birds. The gifts you are giving away made me smile. 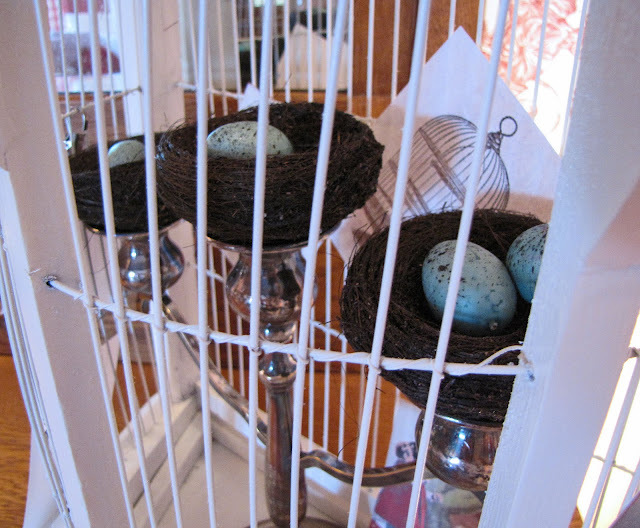 The bird nests made me remember trees I climbed... just to get a peek at the eggs a mother bird had hidden in her home. The cards are so sweet - love them! Please enter me! great giveaway. It is truly a unique pieice, and I love the way you have attached the vintage cards to it. You did the perfect thing to it -- painting it white! I'm going to be keeping my fingers crossed. I am, indeed, a follower of yours! Now that is a very generous giveaway! I'm signing up to follow. Hi there. Gorgeous giveaway! As the last poster commented, not sure you are doing this outwith the US, but wanted to say how lovely and what a great makeover! This is really pretty, Leslie! What a transformation to that birdcage. I need to find those clips; I think they'd work perfect on that screen I have in my living room. This is so perfect! I can see a fairy (I make miniature dolls) perched in there. I love it! Love your blog - had to become a follower! Hi, Cool giv a way!! The makeover on the birdcage was soooo necessary. It looks perfect especially when you tag on the prints. I'm a follower!! Yes! I would have bought that! Hello again! I'm a new follower. So I guess I just have to make my one chance count and say, "Hi!" WOW - that is a great facelift you gave that birdhouse! Please enter me in your giveaway! It's great! Feel free to hop over to my giveaway and enter if you'd like!! Hello, friend! I'm a new follower! What a fun collection! Thanks for the inspiration and the giveaway! Love all your stuff Leslie! Everything is always so beautiful! Love it!!! I hope that I win!!! Thank you for joining this give away and I am glad to have found your beautiful blog. two months ago i wouldn't have bought it, now I would have happily snapped it up and danced all the way home. it looks FAB! my daughter is getting married in january and loves all things vintage. she has asked me to look out for a birdcage for her decorations at her wedding. Such a great giveaway!! I love it all! So glad I came across you sweet blog! Hi, new friend!! :) That birdcage is so cool!! How very sweet of you to have such an awesome giveaway!! What an awesome and creative giveaway. Thanks for sharing! Count me in! 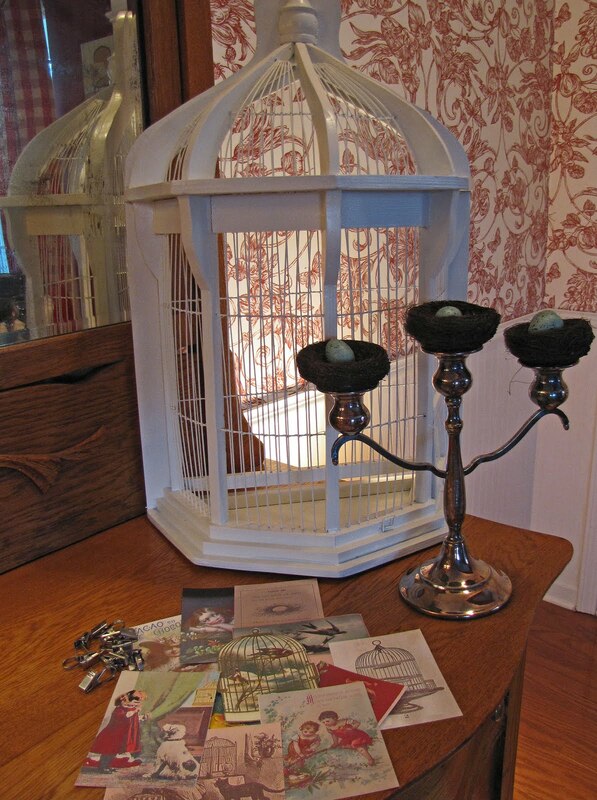 What a delightful cage and accessories! I love your IKEA trip - fantastic! Marvelous give away...please enter my name!! I'm an excited new follower as well! Very cool giveaway! I like things with birds!! Sign me up kiddo! You are very strong for parting with that birdhouse, I don't think I'd be able to let something so pretty go! I am going birdie over this giveaway...I am a long time follower...thanks for a chance to win! Hi Leslie, I just found you through Twice Remembered. I've spent some time going back through your archives. I have to say I adore your basement cafe...so wonderful! Please enter me in your giveaway and I hope you stop by and enter mine. Leslie, I just became your newest follower. I am looking forward to all your future post. Hi, Leslie! THis is such an awesome giveaway and right up my alley! 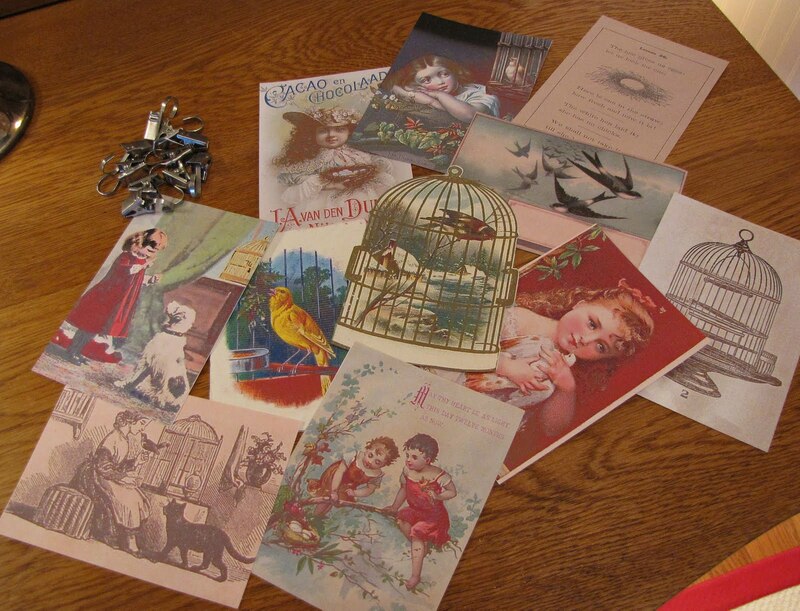 Our last name is BIRD, so of course, I collect birdhouses, birdcages, nests, etc!! I would love to win, so please enter me! Oh, and did I mention I adore polishing silver?!? I've got a new wall grouping of silver on my blog that you should check out! I'm having a Cottage Charm giveaway, too, and would be honored for you to stop by and enter mine! Hi, Friend! I'm your newest follower now. I don't do Facebook, but I'll be more than happy to add your giveaway pic and a link back to you to my sidebar!! I do I do and I would love to win yours!!! I love it! Love your bird house theme! I also want to say I am so jealous of the cabinet you found by the side of the road! What a wonderful job you did with it. OK I just added networked blogs from facebook to my blog also! I would love to enter your beautiful giveaway! One of the best I've seen! Thank you for your generosity! I spent some time looking at older posts on your blog and realized that I would like to come back and visit. I am your newest follower. Just became a new follower. Now off to catch up on old posts! What a beautiful giveaway, Leslie! Please count me in! My giveaway is also "for the birds!" Stop by and enter if you're interested! I'm also signed up as a follower! Looking forward to sharing with you! Hi, love the birdcage facelift...can you do that to my face lol!~ Have a great weekend. I will be doing my second linky party tomorrow...Garage salen SUnday...hope you can make it. eeeek, I am in love!!!! ok, I already have a place picked out for it...does that count for extra entries...lol...I love it. thanks! I am now! a follower! I just found you and I took spray paint everything white and it looks so much nicer. My blog is about living a pink life--making things pretty even everyday stuff. Have a fun day! We would like to enter in your giveaway, I found you in Show N Tell on Cindy's blog- "My Romantic Home" this is so cool, we get to meet people all the time. We are glad we found your blog. It is very nice and you have tons on nice things to share with everyone in blog world. Really???! Wow! I'd love to win! Hello sweet Leslie - I am so excited about your giveaway goodies! That birdcage is fabulous! Love how you transformed it. 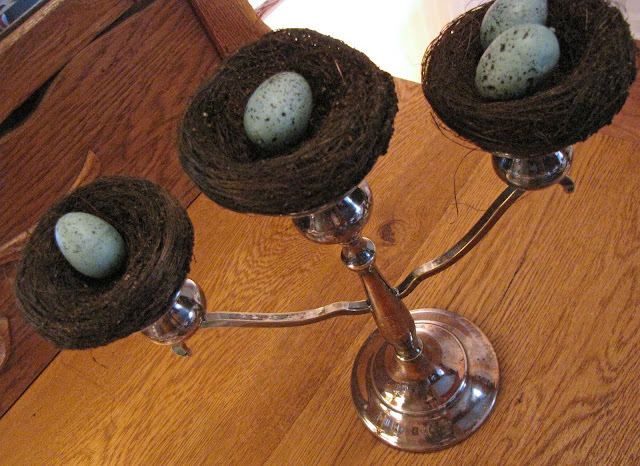 And the candelabra is so pretty with those sweet nests sitting on top. And I love postcards. Oooh my fingers are crossed! Hello sweet Leslie - I'm a new follower of your blog! Thank you for another chance to win your lovelies! Continue to be amazed at your "eye" for art and style. Very nice. Wonderful!!! The birdcage is perfect -- I especially like that it is flat on one side. I'm keeping my fingers crossed! Hi New Friend. I am looking forward to visiting you and your lovely home. HI! Please enter me...such a sweet giveaway. What a great giveaway! Count me in!! Oh, yes I would have bought the cage! Like you I can see things with spray paint. Please enter me. I have always wanted a bird cage! Love those nests too! What a sweet giveaway! 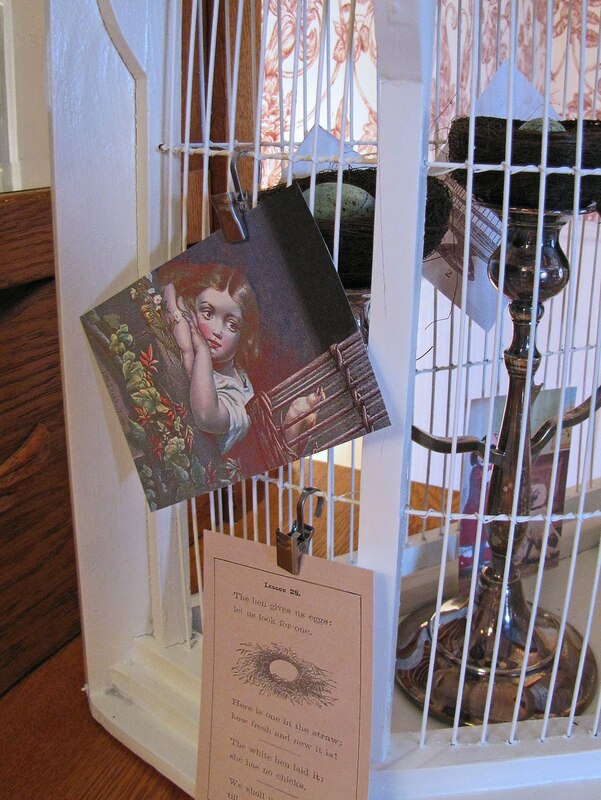 I love birdcages, though I have none in my house. Love your blog and I just became a follower! Please come over and vist when you have a chance. What an awesome giveaway. 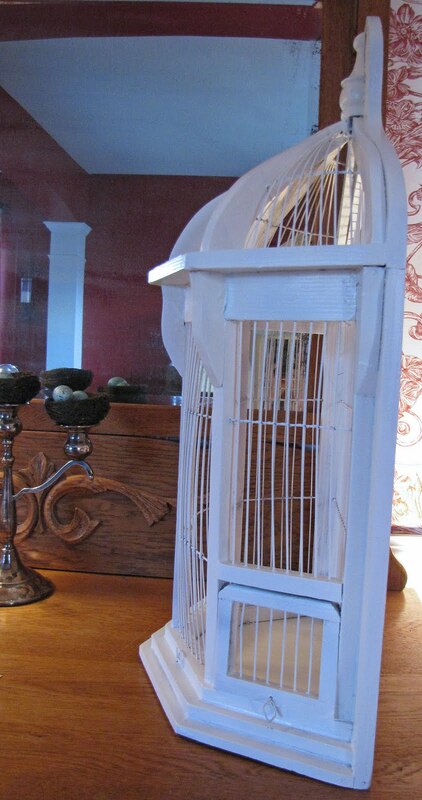 I love the birdcage painted white. Please enter me, and I'm a follower also. Oh, my goodness, just found you and your blog. What a cute giveaway! :) You really did pretty it up. Those little nests with eggs are adorable. I found you via New Friend Friday at the Creative Girl. Entry #2 for following you! WOW....can I just say WOW again!!! Not only is it gorgeous - I probably never would have seen the possibilities - but that you are so generous!!! Please sign me up - I promise I'll give it a good home!!! I'm a new follower as well!!! Oooooh, I participating in the Cottage Charm Giveaway also so if you'd like to win, just drop by and see my post dated May 1 and you can win 6 beautiful paper roses scented with Crabtree and Evelyn Heirloom rose oil. That's beautiful - I would love to give it a new home! Wowza! Best giveaway ever! Love, love, love how you put everything together! Thanks for the chance to win! Hi new friend! New follower #160 here! That has got to be a lucky number, right? 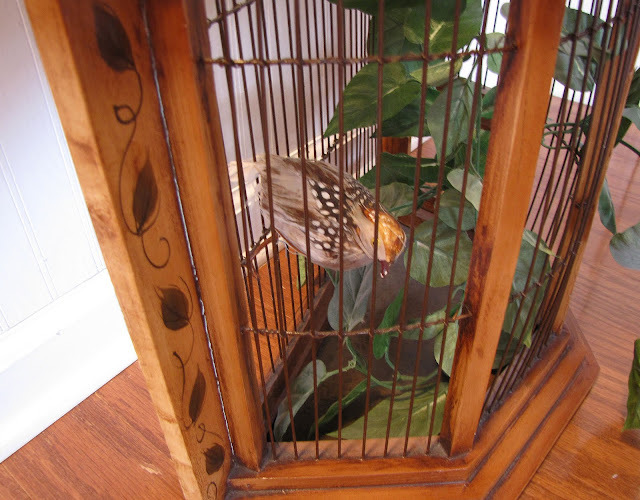 Leslie, would I ever like to give your birdcage a new home! Thanks for offering such a generous giveaway. I'm a new friend Leslie, & have begun following your blog. Have to say those nests are so sweet, as are you to offer such goodies! OMG!! I love this!! You totally rock!! I think I like this giveaway best of all! I soooo hope I win it. but will wish good luck to all, anyway. PS...nice job on fixing up this delight! I have to say this is a most generous givewaway! 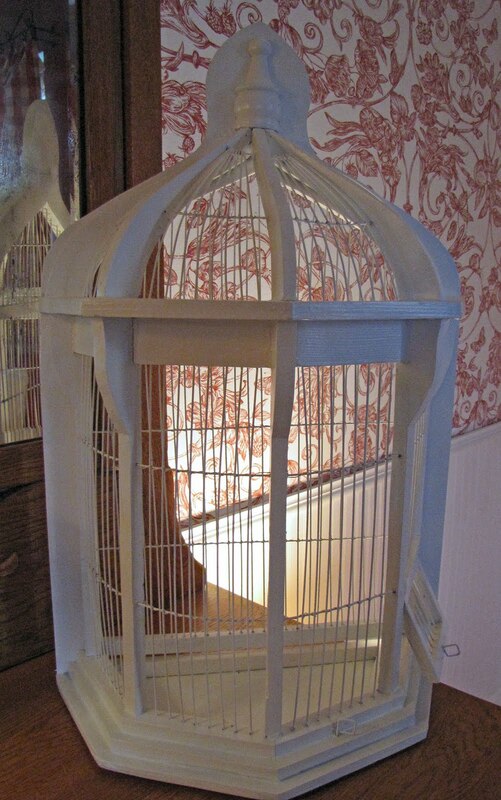 That birdcage has made an enormous transformation with just a coat of paint...of course I would have fought you for it at the sale!! Thanks for the chance to enter...can't wait to see who the lucky winner is! OMG! What an awesome giveaway!! Also, I now follow your blog! I hope you'll return the favor! What a wonderful giveaway you are offering, and I love your blog. Great giveaway! great blog! count me in! This is a great giveaway! I loooove birdcages and have a few I've found here and there. They pale in comparison to your creation. Not anymore, I am on a mission! Thank you again for the opprotunity! your blog is really beautiful.. i don't expect to win though.. just wanted to let you know that i do read you.. even if i'm half a world away.. from Greece.. I just became a follower! Oh I hope I win! The birdhouse is so cute! And what possiblilties.. Thanks for the chance. You made that birdcage look so beautiful!!! Thank you so much for the chance to win! Ouuuu can you hear me squeeling? I am so thrilled to have come to see your give away! I love love love that wonderful birdcage! How fun...... and the candelabra and graphics are fun touches of whimsey! What a great giveaway! This is awesome! I just found your blog, love it, and I am a follower! What a wonderful giveaway!!! Everything looks so pretty all together. 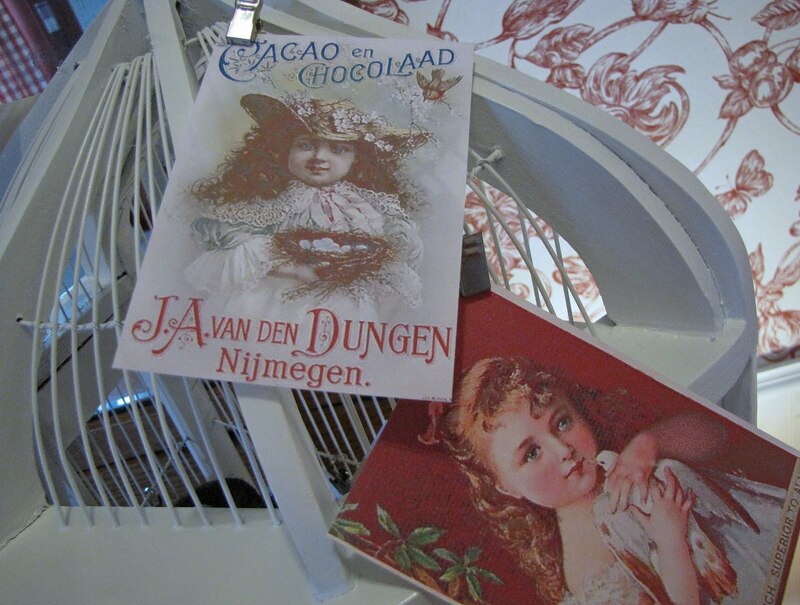 How fun that you used some of my images for your postcards! Thanks so much for linking this up to Brag Monday. amazing...I would love them! You are so generous. Thanks. I am also having a giveaway, so stop by and enter and become a follower and new friend! Hello, again...just became a follower! I will be back often to visit. Hi! I'm not sure that I would have bought the bird cage before but I sure would now with the way you've painted it. Great job on it! I am now following your blog, too. Glad to have found it! I love what you did with that! I would not have seen so much potential! 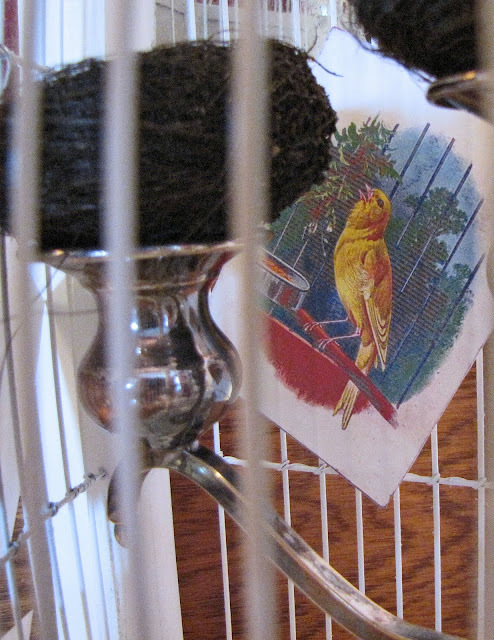 I love, love, love that birdcage. Wow. What a lovely birdcage. I probably would have just passed it by. You really have an eye for possibilities. Please enter me. I just became a follower. How could I not? You are so very creative I want to see what comes next. How fun! Sooo cute! I love it! Stunning!!! leaving this comment and just became a follower...this is a fabulous giveaway!!! Tahnks for sharing with us. 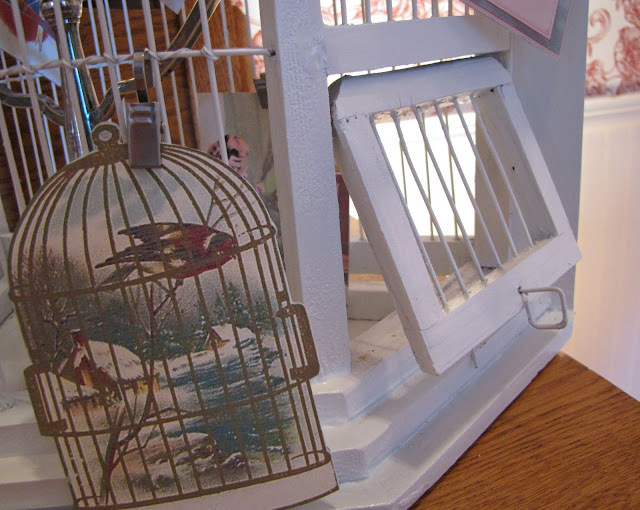 What an adorable bird cage and a great giveaway! I would love to win this. Great job on it, by the way. Oh and I am a new follower as well! What a beautiful blog and sweet giveaway! Yes, I am new here (Came via the OC Cottage) and am so happy to find you. I have already been reading older posts and enjoying myself greatly! I will become a new follower straight away both here and on FB! This is my first time at your blog. I love your ideas!